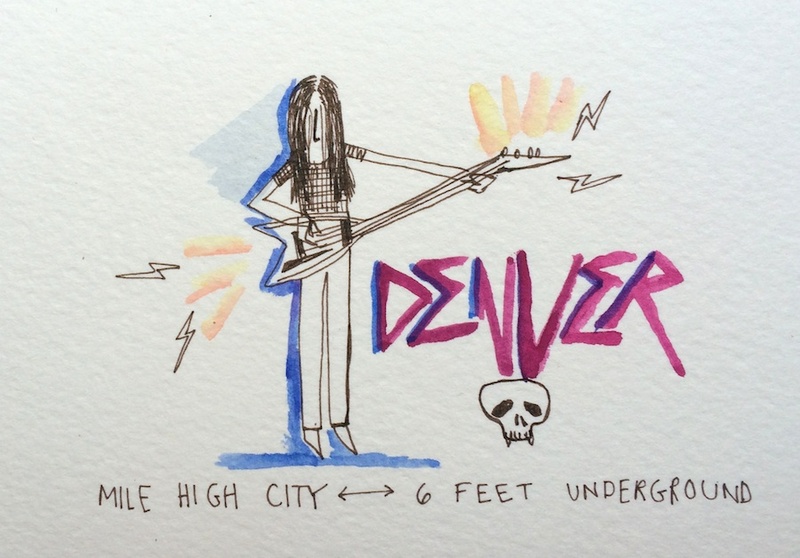 Watercolor impressions of a Denver heavy metal performance by the author. 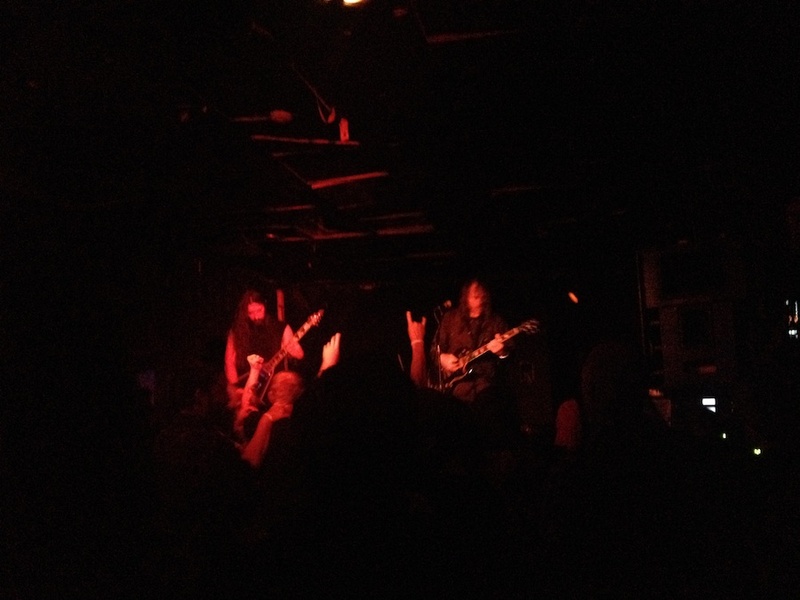 I was invited by several dear friends to see a metal concert in Denver, Colorado, featuring the city’s own Speedwolf. The state’s capitol may be filled with laid-back jocks, but this band draws a different sort of crowd. Morbid, fast, and hell-bent, “Denver 666” is just one of their popular tunes. Despite a proclivity for such diabolically titled songs, my friends assured me that metal die-hards are, in fact, gentle-hearted folks underneath it all. And Speedwolf, in particular, is known for going back to metal’s early roots, forgoing the usual Cookie Monster vocals (officially dubbed the “death growl”) and superfluous antics of hair metal. So, I arrived at the Hi-Dive venue as an unwitting cultural anthropologist, a visiting folk musician intrigued by the darker side of the craft. I was encouraged to think of mosh pits as merely a thinly veiled orchestration of camaraderie. Even so, I stood towards the back of the crowd while the more physically engaged members of the audience shoved at each other. I know several fans of the genre, but my own experience with metal is mostly limited to an appreciation of its aesthetics. Walker Open Field hosted a popular Death Metal Drawing Club two summers ago, and Christophe Szpajdel designed a stylish metal-inspired logo for the institution. Spoofed by Spinal Tap, and revitalized by Anvil!, the genre strikes me as more beloved black sheep than bête noire. Once into the Speedwolf set, I distinctly heard the lyrics and song title, “One Percenter from Hell.” I was intrigued by the title – both angry and critical, bizarre and a little creepy. After some internet detective work, I found that the term “one-percenter” has two very different but equally plausible meanings in this context. Hear the word, and the first that comes to mind refers to a member of America’s wealthiest class. The alternate option I found: a member of an outlaw bike gang. The rebels of the road have been called one percenters since the 1950s when, as legend has it, the American public was assured that 99% of motorcyclists were upstanding citizens. 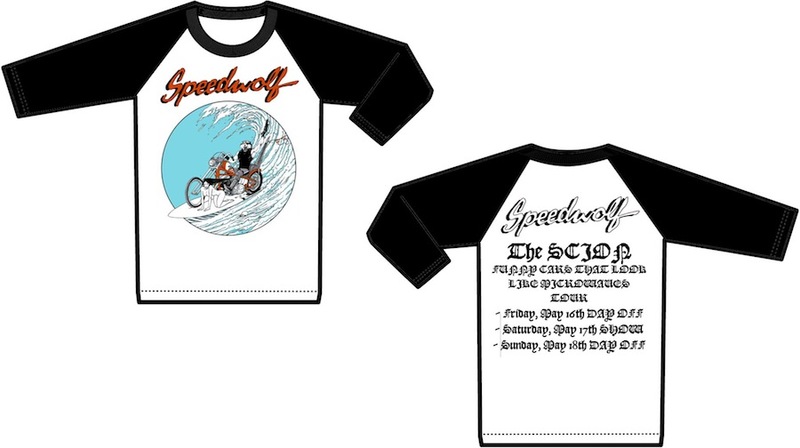 Speedwolf merchandise: “THE SCION/Funny Cars That Look Like Microwaves Tour.” From the band’s Facebook page. Free PORK issues were on offer at the show. Portland’s PORK was founded by husband-wife team Katie and Sean Aaberg, both of whom grew up in the relaxed vibe of the 1970s East Bay in California; Sean is the son of New Age pianist Philip Aaberg. Everything about PORK is done in purposefully bad taste and resistant to anything politically correct or “square.” Self-classified in the category of “weirdo art and rock n’ roll,” PORK liberally employs the pictorial lexicon of lowbrow American culture, bodily fluids, and gallows humor. Inspiration includes Art Spiegelman’s Garbage Pail Kids, R. Crumb, and punk culture in general. In a PORK interview with Mr. Aaberg, Speedwolf lead man Reed Bruemmer was asked about his favorite musical accessories and gear. “[Being] a ‘vocalist’ or pro yeller or whatever the hell I do, I’m not really a gear guy,” he says. Aaberg clearly appreciates this “back to basics” sound of Speedwolf and goes so far as to contrast their old-school style with the “million nonsensical sub genres [of metal],” some of whom “even [use] Art Nouveau art.” It seems that’s the ultimate insult – to leave the harsh and often tasteless metal aesthetic behind in favor of soft, French-inspired beauty. Excerpts from PORK Magazine, Spring 2014. Even based on this limited information – a one-off heavy metal concert in Denver and a free Weirdo magazine – I find I have developed a soft spot for genre and a lingering curiosity for this Pandora’s box of campy-grotesque counterculture. 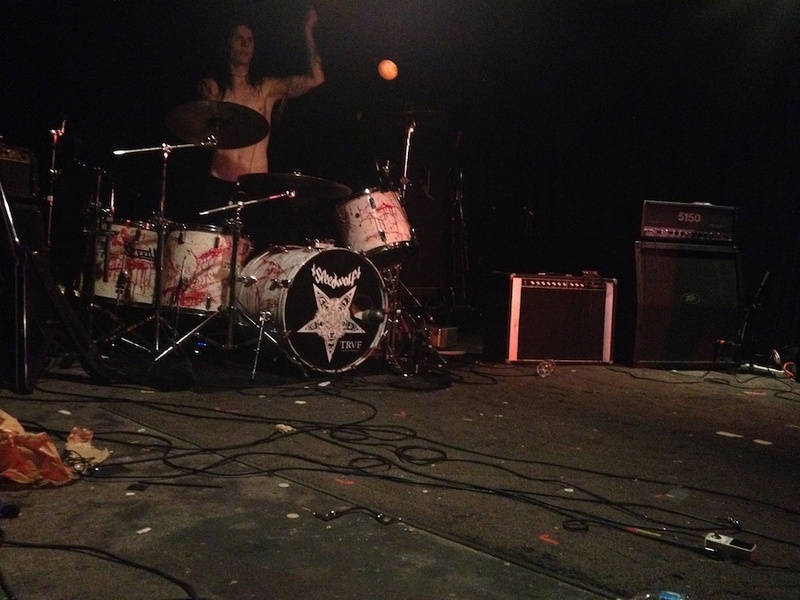 I mean, sure, Speedwolf’s drum set appeared to be blood-spattered, and many of the songs revolved around the themes of death, anger and the devil. And yes, there was beer propelled and sprayed over the audience; I saw a crowd surfer in a Peyton Manning jersey and wolf mask, and even caught wind of an off-color jab at folk musicians (the horror!). And yet, there is a discernible respect for craft in this music. At the end of the concert, a man stood directly in front of me. Cautiously, he turned around. “I’m not blocking you, am I?” he asked. I shook my head. No worries. California native Chloe Nelson is an art historian and musician moonlighting as a curator of Americana. She’ll be sending in photo-essays from time to time for a Road Songs series on the mnartists blog as she drives across the country, harmonizing and honky-tonking in country outfit Tanbark. She tweets @chloefnelson. All photos taken by the author.